Our temperature has dropped a few notches in the last two days along with a bit less humidity so canning pickles yesterday wasn't too bad. The only part of making pickles I don't care for is scrubbing off all those little black nubbity-nubs on the pickling cucumbers. But listening to an audio book while doing so makes the task go quickly. Sort of. I got exactly six quarts (down to the very last pickling cuke I had harvested) for this first batch of dill pickles. We go through about eight quarts a year of the dills, and I like to plan it so I have to plant and grow the pickling cukes only every other year. That means I have a couple more batches to go for my two year supply. Actually, the vines are just starting to move into full production so I shouldn't have any trouble getting as many as I need. Humidity is back up there already this morning so it's gonna feel not-so-pleasant again regardless of what the thermometer climbs to. Guess it's still summer time in the north woods! Anybody else dreaming of those cool, crisp autumn days on the horizon? My bush beans and second cucumbers are looking so lush that I can't get my head around the fact that it's August. But I'm ready. The local nursery has their Mums. Cooler weather ought to be just on the horizon. Those pickles look so good! 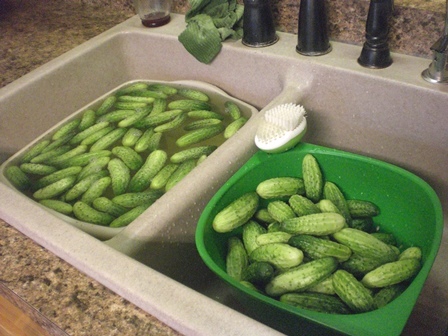 What type of pickling cucumber do you grow, may I ask? Aren't audiobooks wonderful? Dreaming of Autumn? :-) I asked the same question. A summer memory I have, is of my mother canning, tomato sauce maybe? The heat in the kitchen was awful. And I was so glad to escape out doors. So.... I never canned in my life. Dreaming of autumn every day! Susan - I've always been extremely happy with Northern Pickling which I get from Johnny's Selected Seeds. The seeds (in the packet) stay viable for years and produce wonderfully. Neither Papa Pea nor I could exist without audio books to listen to while doing mundane chores. And what a boon to someone like you who has that long commute in the car every day! wisps of words - Yes, I immediately thought of you when I wrote that regarding autumn. The only thing my mother ever preserved was grape jelly from our Concord grape arbor. (And it was wonderful.) I started canning and preserving as soon as we were married and started gardening because that was the only way we could be sure of the quality of the food we were getting. I freeze all my vegetables because canning destroys so many of the nutritional value with the heat of canning. (Plus, they taste so fresh when frozen!) But I do can pickles, relishes, jams, and some blueberries and raspberries in a very light syrup. No pickle canning here this year. Yours looks wonderful. I would like to mow my garden down and be done with it. Yes, fall is looking much better than summer. I can't wait for the cooler weather. This summer has not been pleasant at all. You pickles look divine. Give me a tip on how to keep powdery mildew at bay in this horrible humidity. Michelle - If I weren't on a kick of trying NOT to make time go by faster, I'd be right with you in wishing it were the middle of September instead of the middle of August! Kristina - I think it would be a very good idea for you to mow your garden down, get it fertilized and plowed up. You wouldn't have to think about it anymore and you could spend the time making plans for next year. Theresa - Oh, that rasty powdery mildew!! I have been so lucky this year in that I've had very few insects bothering the garden (except for those dang cabbage moths that hit late and seem to be multiplying unmercifully!) and no blight or powdery mildew either. With all the humidity that could really be a problem. We seem to get a lot of wind though. If you are more protected and don't get the breezes, that might account for it being a problem for you. We've already had a "touch of Fall" here and "Fall is in the air", both comments made by the local weatherman. The tree outside my kitchen window has red leaves on it and I have seen others changing also. Pickles are a lot of putzy work. We do it in groups, usually at my house as I have an outside kitchen, lots of room and a canner that holds 15 quarts at a time. Will do pickled beets this week. I love photos of canned goodies - they look like jewels. I've never found a recipe for processed dill pickles that passed the required vinegar to water ratio and still tasted good. Mine turned out too sour and not crunchy after I switched from my old, unsafe refrigerator pickles. Any tips or recipes you could share? Your fruits and veggies always look wonderful. The pickles look good. My Dad and mom had a very large garden when I was young. There was one big garden just for strawberries. Dad had a really green thumb. The vegetable garden was loaded with all kinds of vegetables There was corn, carrots,beets, string beans, lettuce,potatoes, cucumbers,chives,tomatoes,peppers, melons, and watermelons. I probably forgot some of them. All of us use to have go down to the garden and weed . That was our job in the summer. Dad would find my younger brother and me in the strawberry patch eating them. He'd give us the devil. They were wonderful times. I always felt so bless to have really wonderful parents. I think fall is the best time of the year. It's still very humid here. Suppose to get rain this weekend. I'll believe it when I see it. 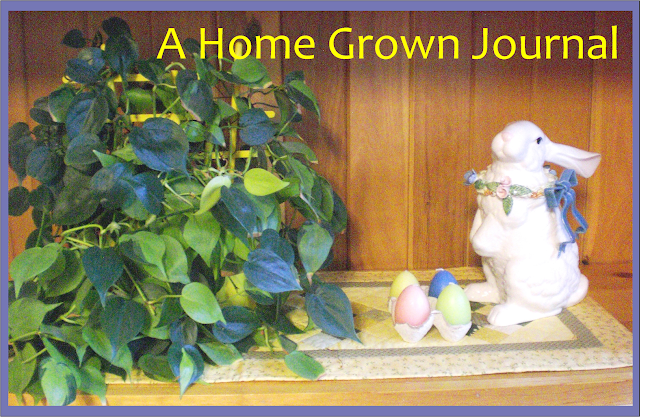 In getting back to the garden, my Mom would can all of it and we would have vegetable all winter long. I am a born to an Illinois farm girl family of 13 including parents. My mama may have canned or helped can at home in Bloomington but never out west. My Daddy was a meat and potatoes kind of guy and to be honest except for ice-burg lettuce with homemade thousand island dressing I never ate anything but canned veggies and fruit. When I met Geoffrey he came with a mother who cooked things like eggplant, spaghetti squash, fresh beans, fresh peas and so on. I was blown away WOW!!! So when we subscribed to Countryside magazine in the early 70's and I started channeling my grandparents the homestead mentality sprang forth in full bloom. I was baking bread and entering the fair before we married. I took in the barns with all the glory and those darn cute nubian goats. Like I said it is all in the DNA. When the kidlets began to come along and we answered the call and left town for the country the canning really took over. 150+ quarts a summer I was in pure bliss. Yes coated in sweat too canning someplace it gets 110 plus all summer with a cheap mentality (no turning on the cooler) got dicey often. But I loved every minute of it. Wish I could make use of your extras Mama Pea but I did write the cucumber tip you gave Michelle will be checking that out.I appreciate the tip about the audio books. I listen on long trips but never thought along your lines. Slap me long side the head for that! Our cucumbers did well this year, too. I think we have 6 pints of pickles, so far. We'll do a mix of dill, sweet, and bread-and-butters before we are done. You all are making me feel a little (just a little) guilty - we do run our AC most of the summer. An advantage to being blessed with a nice day job, I suppose. It still gets hot in the kitchen, but not like it would with the AC off. Our house is a two story, walkout basement and the kitchen, living, dining, and "office" rooms are down stairs. No rear or side windows for cross-breezes down stairs! I like podcasts to listen to when I'm doing more mundane tasks. I have this nifty device I wear around my neck that Bluetooth links my phone or iPod audio right into my hearing aids, so it works out great. I love it! Athanasia - Our weather certainly hasn't "had a touch of fall" yet, but we are seeing leaves drifting down from the trees. Some are turning a bit yellow and I think that may be from our need for rain. 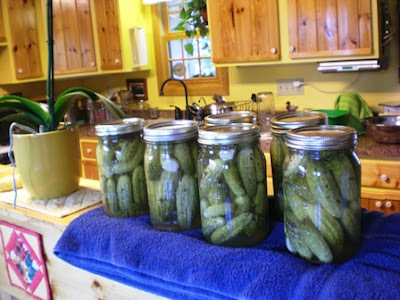 Nancy - For some reason, making pickles is my favorite canning job. I only do dills and bread and butter. StrictlyMystic - I've always had good luck with my dill pickle recipe. Would be glad to share it if you wish. You could go over to my "Contact Me" button and send an e-mail, and I'll send it back to you. I feel the same way you do about rows of canned fruit or veggies. Love those old time pictures of a farm woman in her cellar with the shelves filled! Goatldi - Loved hearing a bit of your history! When we married and moved to the country, most of my "city" relatives thought I would be terribly unhappy and the marriage wouldn't last. Like you say, I took to it like a duck to water. Where did that come from for us?? I listen to an audio book when doing dishes (my most unfavoritest householdy task) nearly all the time. I'm done before I realize it. Mark - If we were to have summers continually like this one has been, I don't doubt we would be looking into air conditioning, too, so don't feel guilty at all. Both of us are suffering because we're not sleeping as well at night as we want. I personally don't like the thought of AC and the "artificial" air it creates, but if we could get good and much needed sleep, I might get used to it! Have to admit I've not gotten into podcasts (Mrs. Dinosaur here) but sure do enjoy the audio books. Whatever works, eh?